Dobbins Creek Vineyards is set against the backdrop of the beautiful Swan Creek area in the Yadkin Valley. Our vines first took root in 2002 with additional plantings in 2003, 2004 and 2006. We finished construction on a tasting room (pictured right) in late 2007. Dobbins Creek Vineyards offers spectacular views. On most clear days you can see the buildings of Winston-Salem about 43 miles away and on a very clear day you can see the top of Grandfather Mountain about 73 miles to the west. Come out for a visit, enjoy the view and taste some great wines. Inspired by one man's passion, along the foothills of the Yadkin Valley of North Carolina, lies Elkin Creek Vineyard. From the hand-hewed beams of the winery, to the hand-tendered estate vines, you will sense the rhythm of man in harmony with nature. Experience a blend of tradition, passion and nature celebrated by the art of wine making that is captured in each handcrafted bottle. Enjoy a delightful meal — prepared in a hand-built, wood-burning brick oven — at The Kitchen at Elkin Creek. In fact, Southern Living magazine calls the Kitchen at Elkin Creek 'the best in the valley.' † Open Thursday, and Friday for dinner, Saturday for lunch and dinner and Sunday for lunch. Due to unique nature of our dining room, it is strongly recommended that guests make advance reservations. Elkin Creek Vineyard is the premier destination in the Yadkin Valley for your wedding or special event. Laurel Gray Vineyards currently encompasses 5 acres of French Vinifera grapes, 70 Jackson-Perkins roses, a 75-year old milking parlor converted into our tasting room-gift shop, a picturesque farm pond, and a big red barn. We invite you to visit our vineyards and farm. Come taste our wines, picnic by the pond, relax in the front porch glider while watching for wildlife, and become new friends. Nestled on nearly thirty acres in the foothills of the Blue Ridge Mountains — deep in the heart of the Yadkin Valley of North Carolina — lies McRitchie Winery & Ciderworks. We are a family owned and operated winery and vineyard specializing in small lots of award-winning artisan wines and hard ciders. Our dedication to sustainable growing and low intervention winemaking has resulted in wines and hard ciders as expressive and distinct as the land whereupon the fruit grows. Soon to be open winery featuring Portuguese and Spanish varieties. After a long and exhaustive search, the Raffaldini Family found an extraordinary section of land that not only reflects their heritage but also holds the promise of making truly classic wines. Some of the varietals are so unique, that the Raffaldini Family is not only the sole vineyard in the East Coast to plant them but also the first in the United States. Tasting room hours are Thursday and Saturday, 12-5 pm; Friday 12-6 pm; Sunday 1-5 pm and by appointment. The tasting room opened in June of 2008. Our 2011 grape harvest was close to 40 tons. In August of 2011 we sold the Yadkin Valley Wine Company and in December we purchased the vineyard and winery from Buck Shoals and opened Windsor Run Cellars in March of 2012 SSV was founded in January 2005 with the purchase of pristine farmland in Hamptonville, NC. Our first planting was in April of that same year. We planted 2 acres of Merlot and 2 acres of Cabernet Franc. The following year we planted 6.5 more acres which consist of 1.5 acres of Seyval Blanc, 1.5 acres of Chardonnay, 1.5 acres of Viognier, 0.5 acre of Chambourcin, 0.5 acres of Petit Verdot and 1 acre of Cabernet Sauvignon. 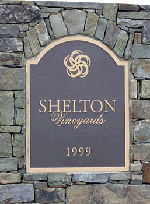 Founded in 1999, Shelton Vineyards is the largest family-owned estate winery in North Carolina. Located in the Yadkin Valley near Dobson and Mt. Airy, NC, the winery features a spacious visitor center with a tasting bar and gift shop. Shelton Vineyards offers tours and tastings every day of the week. Shelton Vineyards' grounds are beautifully landscaped, and picnicking is encouraged. Picnic supplies are available on the premises. During the summer months, Shelton Vineyards sponsors a summer concert series on our outdoor stage. In 2011 Chuck and Jamey Johnson purchased the land, winery and tasting room. They changed the name to Windsor Run Cellars, expanded the tasting room and reopened in March of 2012. The Johnson's who also own Shadow Springs Vineyard, ½ mile down Crater Road, plan to continue the hard work the Craters have put into the land. They will continue to make some of the wines Buck Shoals was famous for and will add a few new products along the way.